Friends! How nice it is to be in headspace to be giddly writing a blog post after a blur of April and May. I was in the throws of spring retail excitement and planning yCPD Field Day, which Andrea at Loubies and Lulu was so gracious to join me for and recap here. I worked my tail off those months, at work, at home, in the community and in the gym trying to stay zen through it all. I also did that thing where I take my life out on dessert. First a nightly treat, then an after work treat then some almost all day cookie grazing. I felt off balance and knew it was my diet. I've come to know what my body feels like when it is alkaline (meaning balanced pH level) and when it is off balance. My alkaline body naturally craves healthy choices, sleeps better, worries less and has more energy in the day. I was almost none of those things by the end of May, so I knew something was up. In the four years of writing here, I've always wanted to come from a stance that a little self-nurturing mixed with discipline is a positive thing. I decided I was due for some of that food wise, but when my blood sugar and acidity levels are out of control, my first craving is sugar (usually cupcakes or cake). I wish I could take small steps to get back on the wagon at this point but I've realized something short term at more disciplined makes fast changes in my body and puts some mileage under me that I want to keep going. Short term and disciplined is different than drastic to me, which I really try to avoid in my life. I do definitely know the benefits and my love for juicing, but a juice cleanse seemed too intense for me before. 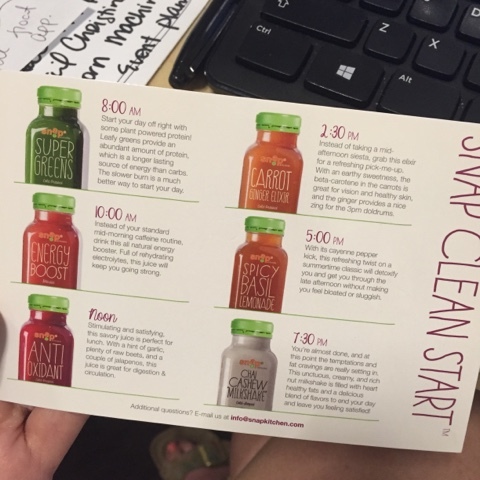 I love Snap Kitchen so much (they are pretty much all of the healthy foods I ate when I was so busy! ), that I kept taking a look at their juice programs. At 1100 calories a day and a variety of nutrient rich juices, it looked like a solid base for a healthy, three day turnaround. Looking back, if I had told myself this was all I was allowed to eat for three days, I would have turned on myself in an instant. I instead coached myself to focus on the opportunity to let the nutrient-rich juice help me feel balanced and satiated and allow this to be a short-term practice in mindful eating. With that in mind, I wasn't bound to anything and could supplement however I felt I needed. I pre-bought the food items above so I would be armed with better options, but didn't make myself eat or not eat them. It was really eye opening to me how the satiation process works, where when we are feeding our bodies what we need in an easy to digest form, it doesn't have to be about volume! I also used this as a time to reset the relationship between food and my workouts. It's no secret that I love a high-intensity workout like spin. Feeling almost over stimulated helps the time go by for me and gets me out of my head. It can also effect my food intake where I justify eating more than I might need because of a "hard" workout or I am trying to get my blood sugar back up after getting it too low in an intense cardio session. 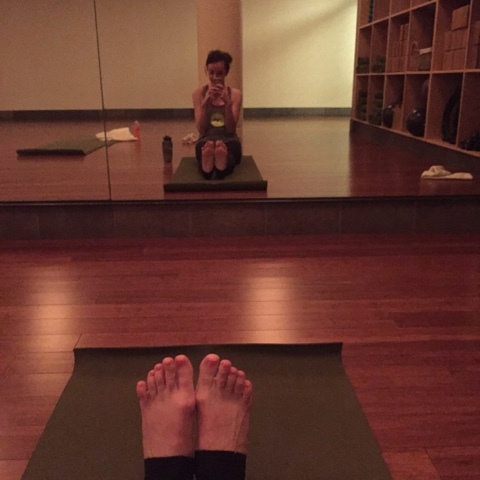 During my cleanse, I picked more self-nurturing workouts where I would break a sweat and stay connected to my body but could likely stay in a more mindful place in my eating as well. I really loved the break and I think this is something I am going to continue! The last day of my three day, Snap Kitchen recommended the Go Green pack to help me really get filled with nutrients and alkalized since dark greens are some of the most alkalizing foods. 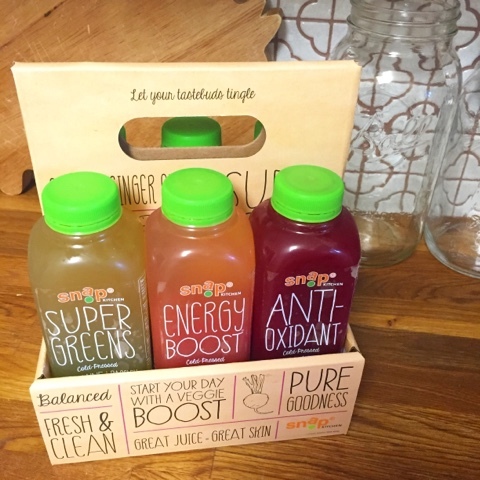 By the third day, I was really beginning to crave these juices and their immediate hit to my system. I loved this pack so much I could see myself picking it up now and again for a little Monday reset! I know it sounds silly, but I kept noticing my eyeballs felt amazing, really white and open with energy. I was looking at the clock at work and realizing it was almost 4:00 p.m., and the typical afternoon slump was long behind me. My skin was really transformed, which I thought was really significant after just three days of changes. One of the best side effects was that I felt really valuable and proud of myself. I was taking care of myself and seeing positive changes that I wanted to keep up. This wasn't punishment for eating bad foods before, it was realizing I deserved a little better than what I had been cramming down and making some effort to start that. 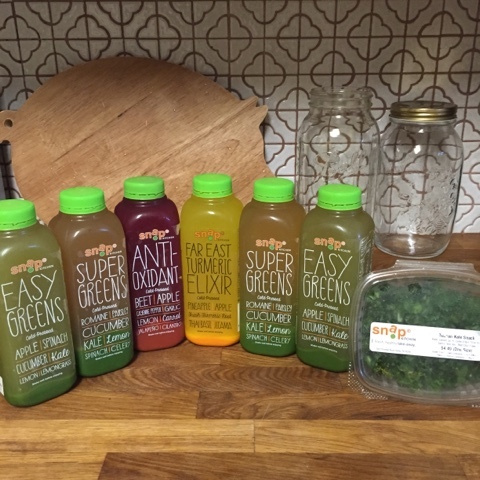 The Snap Kitchen Go Green juice cleanse pack. The day after my cleanse, I did what any rational person would do and hopped on a plane to Mexico. It could have been a rationalization to let it all loose, but I was really happy that being in an environment where so many fresh foods were available, I was excited to keep myself feeling as good as I did when we left with fresh juices and coconut water, lots of avocado and some grilled fish. I came back from vacation feeling ready to happily ease back into life and less sad, dragging and feeling a need to repent food sins than usual. The gorgeous juices in Mexico! I reached for the "jugo verde" every morning thanks to all of the greens on my Snap Kitchen program! There are so many fresh foods that I love available in the summer, I am really glad I tried a cleanse to get me in a head space where I think Farmer's Market over ice cream truck when I want a fun summer treat! I would recommend talking to your physician about incorporating something similar into your diet, and working with Snap Kitchen to build out a plan that helps you realign and reset your cravings, goals or intuition! Thanks so much to Snap Kitchen for being so passionate about health and nutrition in your communities and partnering with me on this post! Proud of you, Lilly! And Mexico looked fantastic!